Just imagine hosting a wedding party set in an enchanted woodland scene—flowers peering out amidst the foliage, delicate butterflies fluttering about, and the fading twilight bathing the entire scene in a magical glow. This is the setting you can create to bring to life Shakespeare’s well-loved romantic comedy A Midsummer Night’s Dream. Centered around a royal wedding celebration, this famed play is set in the wooded realm of Fairyland under the light of the summer moon. 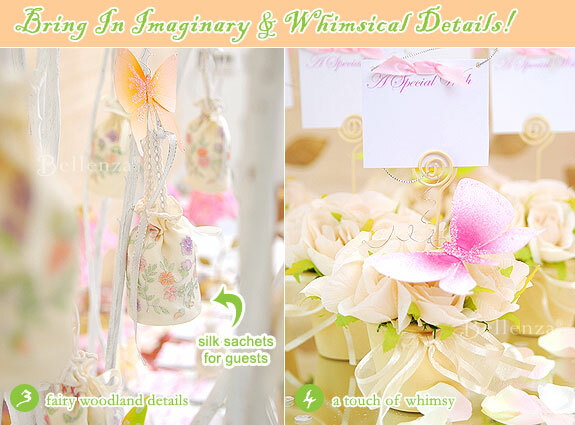 What a delight to bring together dreamy decor elements to stage this world of enchantment! 1. Select a muted color palette – The color palette, for instance, can revolve around the soft, feminine hues of pink, peach, yellow, and lavender set against a dreamy ivory background, with mint green as accent. Glittering accents can then be applied to create that magical feel. 2. Bring in sparkle and glitter – Sparkle and glitter mean fairies must be around, so be liberal with touches of dazzle! 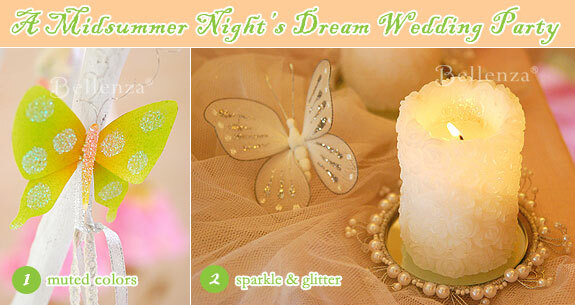 From ceiling swags made of delicate tulle or chiffon, add a sprinkling of clear and silver sequins to catch the light. Highlight fabric butterfly wings with shimmering patterns; and bring the luster of pearls and the glint of mirrors to the tabletop with elegant candle plates. Finally, have lights, lights everywhere—from the soft glow of candles, to the twinkle of tealights in tabletop holders and hanging votives. 3. Include fairy woodland details – Have floral elements everywhere—in petite flower pots, in petal-covered tealight “lamps,” in loose rose petals scattered on the tabletops. And for final fairyworld touches, have gossamer-winged butterflies and dragonflies seemingly perched at random amidst the setting and tiny lights turning the entire scene magical. 4. 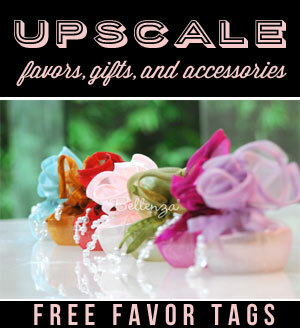 Infuse a touch of whimsy – Bring the reception to a fittingly magical close with a unique “favor tree” that transforms into a “wedding wish tree.” At the start of the reception, use the tree to display your guest favors, such as lovely sachets hand-painted in the event’s color palette. Then as your guests depart, each taking a favor with them, have them use the cards provided alongside the tree to write special wishes or messages for you, and attach these on the tree branches in place of the favors. 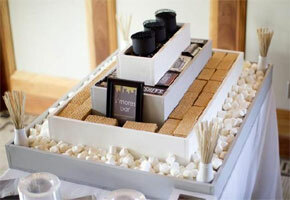 It’s definitely a more personal and fun alternative to the traditional guest book! 5. 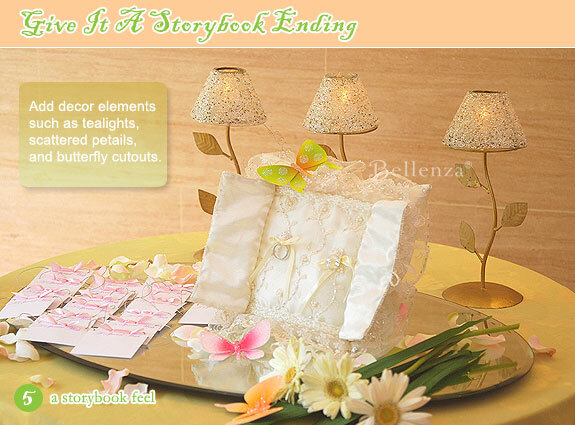 Cast a storybook ending – As a lovely link between this reception and the wedding ceremony that preceded it, display a storybook-shaped ring pillow symbolizing the vows you had just exchanged. The pillow alludes to the literary inspiration for your wedding theme, while you may incorporate passages or quotes from A Midsummer Night’s Dream in your wedding vows. Or you may have written personalized poems to one another, in keeping with the romantic sentiment of the play. To get more information on the story, you may want to check out BBC’s coverage of What happens in A Midsummer Night’s Dream? – The right venue – Recreating fairyland may be simple if you have access to an outdoor garden already blessed with trees, shrubs, and flowering plants. If it includes a little pond or fountain, you’re truly in luck! All you need to do is add the fairytale elements. But if an outdoor venue isn’t available, even an indoor hall or hotel ballroom can be magically transformed into a dreamlike woodland. – Creative table names – For an added whimsical touch, have each table named after a fairyland character from the play, such as the fairy king Oberon, the fairy queen Titania, and the human lovers Lysander, Hermia, Helena, and Demetrius. – Framed quotes – Place romantic passages or quotations from the play in special frames, and display them on the reception tables. For some ideas, you can go to About.com’s page on quotations from Shakespeare. – Fairyland references in the entourage – In the wedding ceremony itself, the fairyland theme of the reception may already be hinted at with the ringbearer wearing a special outfit inspired by the play. While the flower girls, too, may have dainty fairy wings adorning their gowns, and tiny magic wands with glittering accents in place of traditional flower baskets. – Mendelssohn’s “Wedding March” – If you decide to use this popular recessional piece for your wedding, you may note in your ceremony program that this march was actually written by Felix Mendelssohn for an 1843 production of A Midsummer Night’s Dream! I think this is such a unique concept! 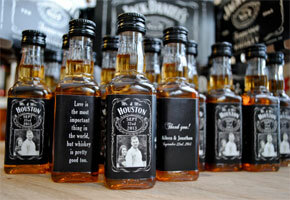 My sister will be having this theme for her wedding in August 2010! A Midsummer Night’s Dream is really a great theme for our next event. Thanks for the inspiration. 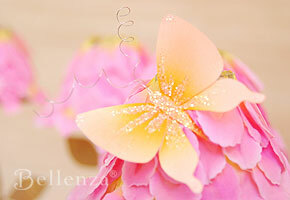 Dahlia’s Day has a great post on Bohemian wedding themes that you may find useful. Here is the post.